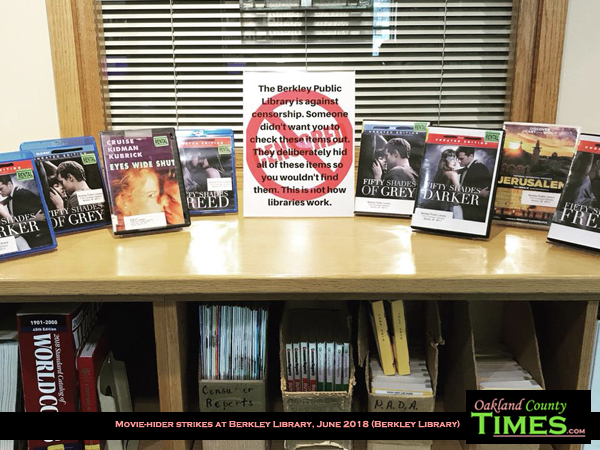 Berkley, MI- Someone’s been playing censor at the Berkley Library, hiding copies of DVDs such as 50 Shades of Gray, 50 Shades Freed, and Eyes Wide Shut. Even the documentary Jerusalem was surreptitiously removed and hidden. Staff have not yet identified the culprit, but after two rounds of DVDs went missing in June, they scoured the library and found most of the missing items in various places around the building. Not only did the librarians put the items back on the shelves, they used the experience to stand up to censorship. The movies are now on display with a sign. “The Berkley Public Library is against censorship. Someone didn’t want you to check these items out. They deliberately hid all of these items so you wouldn’t find them. This is not how libraries work,” states the sign. Because the Library replaced the initial round of missing movies, they now have plenty available. The mystery has been shared on Facebook, with the world knowing more than ever that patrons are welcome to check out movies – even those that have a little spanking in them.